LIN'S GENEALOGY HELPS: How well do you know your ROOTS? How well do you know your ROOTS? 1. Parents: Dad died in 1945, was a dispatcher on the railroad, loved photography, ham radio operating, fishing, hunting, flying and new adventures. My mom was a widow at age 28, worked as a telephone operator, loved traveling, dancing, playing the organ and her family. 4. Do you remember any of your great grandparents? Tell us about them. I knew two of my paternal great grandpas. 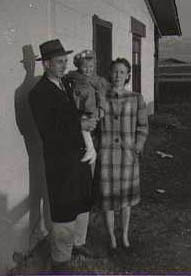 One was a farmer Joseph Vernon and lived in rural Utah, he was a widower. The other was also a widower George Stevens and lived in Los Angeles. He had remarried and was very wealthy working in real estate. I only saw them a couple of times but have written about them in my family history webpage. Great prompts, Lin. My parents and grandparents and great-grandparents were hard-working, good people, too. 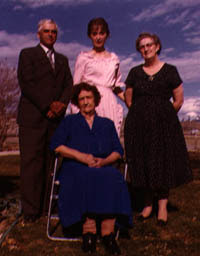 I was blessed to know my father's mother's mother (paternal great-grandmother) and my mother's grandparents. Delightful people, all. They lived in their homes until they passed. Keeping them home kept them close in many ways. I know some of my geneaology but not as well as yod do so I really need to ask Mom and Dad. I never got to meet either of my grandfathers because both had died before I was born. But both my grandmothers were wonderful women. My mom knows a a great deal of her roots because so much of it is recorded. Her mother's life is recorded in a book. My father's side I have heard from stories. It's always interesting to hear the different perspectives. Both of my father's parents [from Ireland] died before I was born. I knew both of my mom's parents. My grandfather[ from Vermont] was a butcher, kind of a quiet man. My grandmother quite a wonderful person. I am named after both grandmothers. I'll have to come back and do this when I have more time, these are great questions to get the 'juices flowing'. My dad's parents died before I was born (waaaay BEFORE). I did get to know my mama's step-grandpa, he died when I was somewhere in elementary school - that was 'Big Pappa or Big Daddy'. 'Big Mama, my great-grandma (Mama's grandma)died???...ummm. I'll look it up so I won't get it wrong. I was grown, married and had the older two kids I DO remember.